We have restored a number of 1967 through 1968 Mustangs in a number of combinations. The MACH 1 line has offered the greatest variations of performance combinations in a Mustang. We have had the honor of restoring 351C, 428CJ, and 428SCJ MACH 1s. Here are a few of our MACH 1 restorations. It's hard to beat the sound of screaming small block Ford. The BOSS 302 shown below is an example of historic preservation capabilities. This car has original tires, paint, upholstery, everything has been brought back to its full luster. We have restored and historically preserved every type of SHELBY Mustang including the GT 350, GT 500, KR 500, and the SHELBY Hertz. Here are a few of our SHELBY restorations. 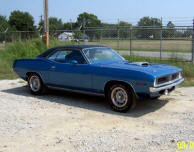 We are currently in the process of taking on other non-Ford cars including some nice MOPARs.